Join us for a group workshop on basic mallet percussion and concert percussion techniques! This workshop is taught by Bretton Jones, an alumni of the Columbus Saints 15-17, and Galaxy Percussion 2017; State Indoor Percussion Champions. Cost is FREE to Flex High Students & $5 for all others. Join us for a group workshop on marching brass instruments! 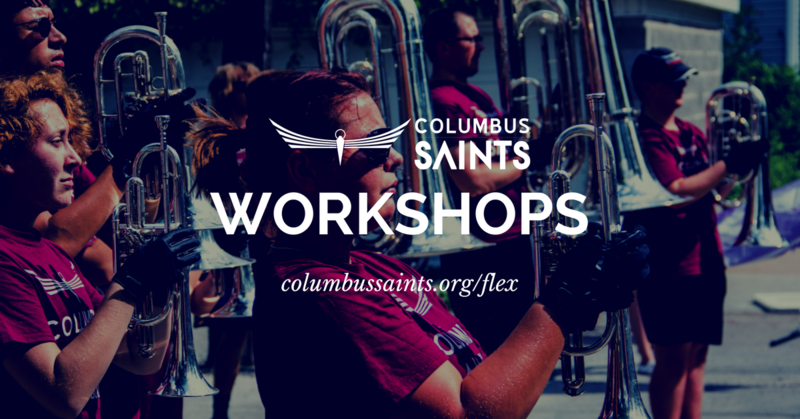 This workshop is taught by Brad Thomas, Columbus Saints staff 15,17,18, and an alumni of Erie Thunderbirds, Cincinnatti Tradition, The Ohio State University Marching Band, and Gold Medalist Tuba I&E DCA. Cost is FREE to Flex High Students & $5 for all others.